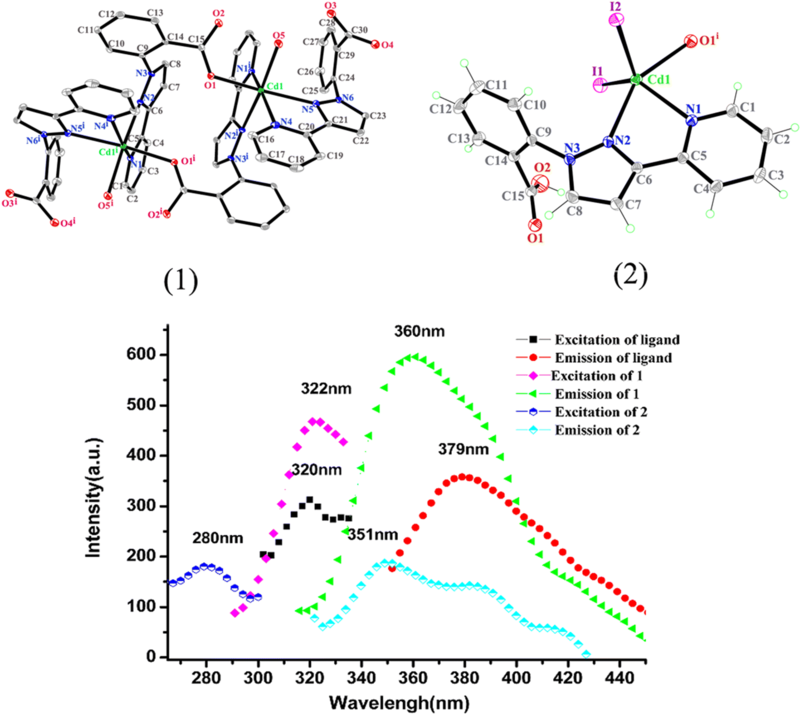 Two cadmium(II) complexes based on 2-(3-(pyridin-2-yl)-1H-pyrazol-1-yl)benzoate with chemical formulas of [Cd2(ppb)4(H2O)2]·8H2O (1) and [Cd(Hppb)I2]n (2) (Hppb = 2-(3-(pyridin-2-yl)-1H-pyrazol-1-yl)benzoic acid), have been synthesized. Both complexes are well characterized by IR, TGA and X-ray single-crystal as well as powder diffraction. Structural analyses reveal that 1 is a binuclear complex and 2 has one-dimensional polymers, respectively, in which they are expanded to three-dimensional supramolecular structures by hydrogen bonds. The Cd(II) coordinated environments in 1 are slightly distorted octahedral geometries, but central atoms in 2 display distorted square pyramidal geometries. There are obvious differences in ligation modes of the ppb− or Hppb ligands for both complexes. In 1, four ppb− ligands are divided into two groups, displaying µ1-kN, N′ and µ2-kN, N′: kO coordination modes. Two ppb− ligands act as two µ1,6-bridges linking the binuclear Cd(II) cations with a distance of 6.282(2) Å. In 2 the neutral Hppb ligands exhibit a µ2-kN, N′: kO coordination mode, and connecting Cd(II) ions by µ1,6-bridges and forming an infinite 1D chain along b axis. 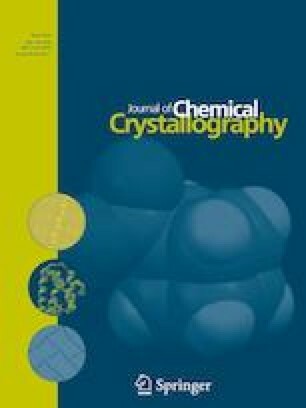 Hirshfeld surfaces and fingerprint plots analyses indicate that weak interactions of C–H···π, π···π, O–H···O or O–H···I play important roles in crystal packings of 1 and 2. Luminescent measurements in solid-state show their different intensities in the luminescences of 1 and 2. A binuclear complex [Cd2(ppb)4(H2O)2]·8H2O (1) and a one-dimensional complex [Cd(Hppb)I2]n (2) were synthesized and characterized by X-ray crystal diffraction. Investigation of solid-state luminescence properties indicates the blue shifts of the emission λmax of complexes. The authors thank Dr Zeng-Qiang Gao at line 3W1A of BSRF for his help with the single-crystal X-ray diffraction data collection and reduction, and acknowledge the financial support by the Natural Science Foundation of China (Grant Nos 21571118 and 21671124). A portion of this work was performed on the Scientific Instrument Center of Shanxi University of China.